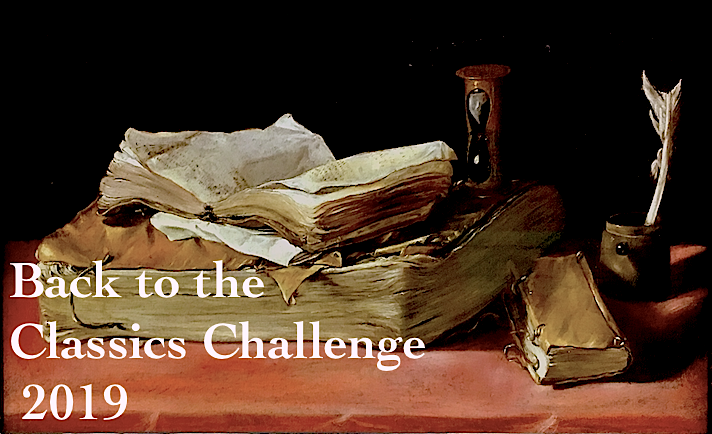 I've really had a hard time sticking to a book lately -- we have so much going on with our upcoming move, it's really hard for me to concentrate on anything -- it's definitely time for those non-challenging comfort reads. 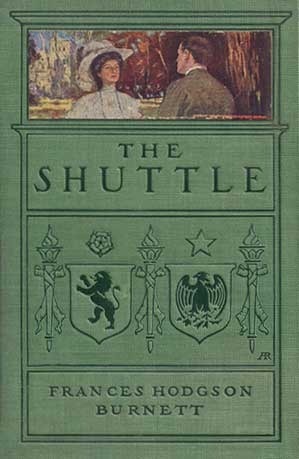 Luckily, the list of my unread Persephone books included The Shuttle by Frances Hodgson Burnett. I actually own a copy from 1907 just like the one picture above. I'd put off reading it because it's just over 500 pages long, but it's in the public domain and readily available for download on my smartphone. I started reading it in bits and pieces, and by the fourth or fifth chapter, I was completely hooked and couldn't stop reading it. Basically, this is the story of a society marriage gone wrong, and the dramatic aftermath. Like Downton Abbey's Cora Crawley, Rosalie Vanderpoel is a wealthy heiress wooed by a titled Englishman in financial straits. Rosalie is young, tenderhearted, and impressionable, and she agrees to marry Nigel Anstruther though she doesn't realize quite how desperate he is. Her younger sister Betty, though a child of nine, sees right through him and dislikes him instantly. Sadly, no one realizes what a good judge of character Betty is, and the marriage takes place. Once Rosalie reaches England, her husband becomes a very different person. He's furious that he can't control her money, so he becomes abusive and cuts Rosalie off from her family with little explanation. Twelve years later, Betty is now a beautiful, intelligent, confident young woman, and she is determined to find out what really happened to Rosalie. With her father's blessing (and his virtually unlimited resources) she sails to England on a mission. On the boat over, she also has a chance encounter with a second-class passenger, James Salter. She is impressed by his forthrightness and strength of character (not to mention his good looks), but assumes she'll never see him again. After finding her sister and young nephew in terrible circumstances, Betty takes matters into her own hands and is determined to put things right at their crumbling estate, with her diabolical brother-in-law, and finds true love along the way. It's a bit of a fairy tale, but what I really liked about this book is what a great character Betty is -- she doesn't wait around for a man to save her, she's frequently the one doing the saving. Of course the fact that she comes from a rich family makes it much easier, but I got the sense that this is a woman that would have done great things with or with out the money. She's a real go-getter. I also loved reading how Betty took charge of improving the derelict estate. The book is a bit like a cross between Downton Abbey (but with an abusive Lord Grantham) and an episode of This Old British House. There are also some fun quirky side characters, like local villagers, the vicar Mr. Penzance, and a traveling American salesman named G. Selden. Frances Hodgson Burnett was born in England but spent much of her life in America, crossing the Atlantic numerous times, and her characters from both countries seem lovingly portrayed. 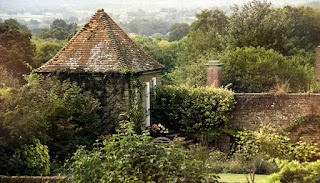 Burnett clearly loved England and you can also see hints of her future novel, The Secret Garden, when Betty Vanderpoel admires the beautiful countryside of Kent and plans improvements with the estate gardeners. Burnett rented Great Maytham Hall in Kent and the gardens inspired her. I haven't read The Secret Garden since I was a child so I think it's time for a re-read. "One feels it so much in a garden," she said. "I have never lived in a garden of my own. This is not mine, but I have been living in it—with Kedgers [the gardener]. One is so close to Life in it—the stirring in the brown earth, the piercing through of green spears, that breaking of buds and pouring forth of scent! Why shouldn't one tremble, if one thinks? I have stood in a potting shed and watched Kedgers fill a shallow box with damp rich mould and scatter over it a thin layer of infinitesimal seeds; then he moistens them and carries them reverently to his altars in a greenhouse. The ledges in Kedgers' green-houses are altars. I think he offers prayers before them. Why not? I should. And when one comes to see them, the moist seeds are swelled to fulness, and when one comes again they are bursting. And the next time, tiny green things are curling outward. And, at last, there is a fairy forest of tiniest pale green stems and leaves. And one is standing close to the Secret of the World! And why should not one prostrate one's self, breathing softly—and touching one's awed forehead to the earth?" I only have a few tiny quibbles with the novel -- as much as I loved Betty, she really doesn't seem to have any faults, and Sir Nigel Anstruthers is a bit of an over-the-top, mustachioed villain. Also, the ending was a little melodramatic for my taste. But overall, this was a very enjoyable read and it's one of my favorite reads so far this year. I'm counting this as my Classic by a Woman novelist for the Back to the Classics Challenge, and also for Reading England Challenge.